he Boston Archdiocese announced the reinstatement yesterday of a Wayland priest who was suspended in June on an accusation that he had sexually abused a minor more than 30 years ago. But the alleged victim's lawyer criticized the move, saying the church had not adequately investigated her client's allegation. The Rev. Ronald L. Bourgault, 63, will return as pastor of St. Zepherin Church in Wayland, Bishop Richard G. Lennon, the apostolic administrator, said in a statement from the archdiocese. He said a church investigation into the allegation could not be ''substantiated.'' Bourgault, who could not be reached for comment, will celebrate Mass at the church for the first time again this weekend, the archdiocese said. The archdiocese released no details of the allegation, but Neila J. Straub, an attorney in Salem, said her client, now middle-aged, had alleged he was abused as an altar boy at St. John the Evangelist Church in Beverly sometime between 1965 and 1967. Straub said her client did not remember the name of the priest who had allegedly abused him, only that he was young, good-looking, and had wavy hair. After being shown photos of several priests who served at St. John the Evangelist during that period by the Rev. 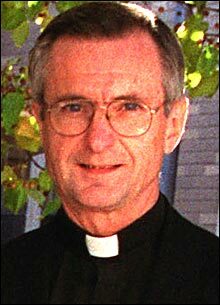 George J. Butera, the church's current pastor, the man pointed to Bourgault as looking most like the individual who had allegedly abused him. Butera relayed the information to the archdiocese in June, and Bourgault was quickly suspended for the duration of a church investigation. Straub said that while her client has had several fruitful sessions with Barbara Thorp, the director of Office of Healing and Assistance for the archdiocese, he did not meet with its principal investigator on abuse claims. Efforts to arrange the meeting with the Rev. Sean M. Connor failed because of the church's refusal to provide her a letter that would ensure that the alleged victim's information would not be used against him in any subsequent court action. ''If my client decided to sue the archdiocese for the abuse he suffered, I wanted to make certain that information he provided the church would not be used against him in any future lawsuit,'' Straub said. She said her client also decided to turn down an offer for him and his wife to meet with Lennon for a healing session because, Straub said, the invitation was not extended to her. ''I believe the real agenda of the meeting was not for Lennon to sit down with my client and enter a healing process, but to test his identification of Bourgault,'' Straub said. She added that she now plans to recommend filing suit against the archdiocese over the alleged abuse. The Rev. Christopher J. Coyne, spokesman for the archdiocese, declined to respond to Straub's specific complaints. However, he said that neither she nor her client had availed themselves of the right to appeal Lennon's decision of reinstatement. Bourgault is the third priest among 28 who were suspended last year that the archdiocese has returned to active ministry. The Rev. Edward C. McDonagh was reinstated as pastor of St. Ann Church in West Bridgewater earlier this month after a church investigation could not corroborate allegations raised by the sister of a deceased man. Monsignor Michael Smith Foster was reinstated twice last year, once after his accuser dropped a lawsuit against him, and a second time after the church reexamined allegations against Foster and could not substantiate them. This story ran on page A11 of the Boston Globe on 2/24/2003.